Location: Located in middle Shaanxi Province, Tongchuan is to the northwest of Weinan, northeast of Xianyang and southeast of Yan'an. History: Tongchuan belonged to the Yong State in the Xia Dynasty (21st - 16th century BC). It firstly appeared in the history as an administrative county in 155 BC of the Western Han Dynasty (206 BC - 24). In the Three Kingdoms Period (220 - 280), it belonged to Beidi Shire of the Wei Kingdom. In 446, it was called Tongguan County. The name remained until 1946 when it was changed into Tongchuan, which then became a prefecture-level city in 1966. Physical Features: It is where the Loess Plateau and Guanzhong (Middle Shaanxi) Basin connect. Climatic Features: Tongchuan belongs to the warm continental climate. The average annual temperature is from 8.9C (48F) to 12.3C (54F). Winter is cold and summer is hot. When to Go: It's better to visit Tongchuan in spring or autumn when the weather is pleasant. On February 2nd in Chinese lunar calendar, the locals hold temple fair on Yaowang Mountain. In March and April in Chinese lunar calendar, Buddhism culture activities are held in Yuhua Palace. From January to February, the skiing festival is held on Yuhua Mountain. Those special activities can be good reference for you to decide when to go. Local Highlights: Tongchuan is famous for its Buddhism culture, health protection culture and ancient porcelain kiln sites. In addition, it produces 30% of the whole province's coal. 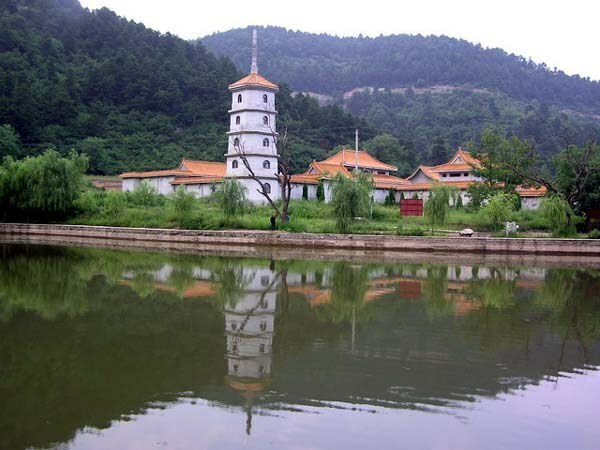 Yuhua Mountain: It is where the great Buddhism Master Xuanzang in Tang Dynasty (618-907) passed away. Sceneries on the mountain vary in different seasons. Especially in winter, the skiing competition and ice sculpture shows attract thousands of tourists. Yuhua Palace: Located on Yuhua Mountain, it is the largest temporary palace of the Tang Dynasty and also the place where Xuanzang translated parts of the Buddhism sutra. Together with its fairy landscape, it was once a holy place of Buddhism in the Tang Dynasty. Yaozhou Kiln Museum: Located in Huangbu Town, it is by far the largest ancient porcelain kiln site theme museum in China, which shows the precious kiln relics and production tools more than 1,000 years ago. Many exquisite porcelain wares of the Tang and Song (960 - 1279) dynasties were made there, among which the Song Dynasty decorated celadon was honored as 'The Top Decorated Celadon of Northern China'. Chenlu Ancient Town: On the top of a mountain in Yintai District, Chenlu has been the most important porcelain production base of northwest China since the Yuan Dynasty (1271-1368). Actually its porcelain kilns can be traced back to more than 1,400 years ago before the Tang Dynasty. The special architecture styles and local customs add more interest to the town. Yaowang Mountain: Located east to Yaozhou District, it is where the famous medical scientist of Tang Dynasty Sun Simiao (also called 'Medicine King') lived in his late life in. Profound history, mysterious medical care culture, rock sculptures and stone tablets forest are highlights of the mountain.